Honesty. Integrity. These words form the foundation of our society. Without people being honest and without people having integrity, our world would crumble into a place of bad intentions and negative actions. 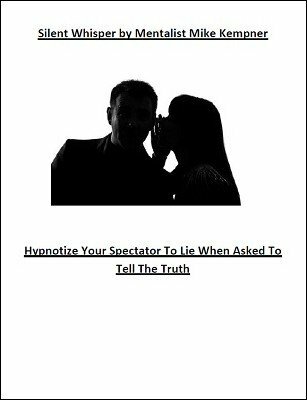 In this routine, you will apparently hypnotize a spectator to not resist lying, even when pressed to tell the truth. Good thing it’s just “hypnosis”, as your power to control the intentions and actions of people in this act will have people believing that you can truly alter the way in which society operates in a world characterized by both truth and deceit. Specifically, you call a spectator on-stage and tell him that you are going to hypnotize him to lie. You whisper the hypnotic induction into his ear, only for him to listen. After he has been hypnotized, you ask a series of questions. Despite your offering him $1 million dollars if he tells the truth, he will lie to every question! Everyone will be stumped, including the genuine spectator who has just lost his ability to go home rich! 1st edition 2015, 1 page.